← Making the perfect cup better? Last week, we took a look at the International Organization for Standards (ISO) and their standard for the perfect cup of tea (ISO 3103:1980). They are by no means the only organization out there that believes it knows what constitutes “perfect” when tea is concerned! 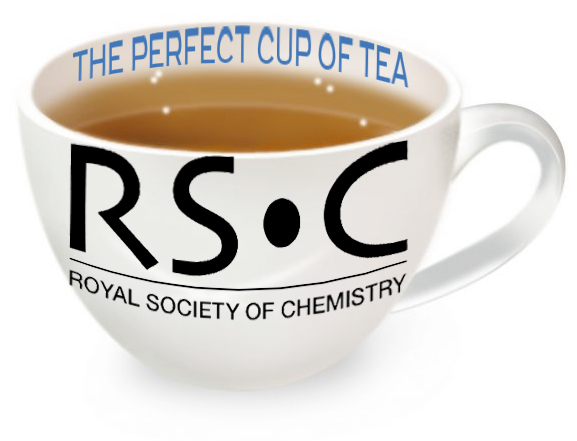 Today, we’ll look at Britain’s Royal Society of Chemistry, and a 2003 press release they issued called How to make a Perfect Cup of Tea (their capitalization, not mine!). You can download this document in PDF format from their website if you’d like. I’m sure the RSoC is a wonderful organization. Their self-description on the press release sounds downright wonderful. Were I a chemist in Great Britain (or possibly even here in the U.S.), I would definitely want to join this society. But a quick perusal of that paragraph above fails to reveal anything about their expertise in tea. Perhaps it’s just that they are British. That must be it. The document begins, logically enough, with a list of ingredients and a list of implements. This raised my eyebrows immediately. I love Assam tea as much as the next guy, but is using Assam really a prerequisite for preparing the perfect cup of tea? Can a white-tip Bai Hao oolong not be perfect? And I’m going to let a bit of my prejudice show here: I’m no tea Nazi, and I’m happy to let you prepare your tea your own way. I do, however, think that if a cup of tea is perfect there is no need to adulterate it with milk and sugar. Oh, my! One of the implements required for preparing the perfect cup of tea is a microwave oven? Please tell me that my friend Angela from London isn’t reading this. It would set her poor heart aflutter. They’re only using the microwave to warm up the cup, but still! It’s the next paragraph, though, that stopped me in my tracks. I simply don’t know what else to say. I’m going to go prepare myself an imperfect cup of tea and ponder this for a while. Posted on 1 May 2013, in Tea Biz and tagged Assam, Assam tea, Britain, British tea, George Orwell, ISO, microwave ovens, milk, milk in tea, oolong, perfect cup of tea, Royal Society of Chemistry, slurping, slurping tea, sugar, sugar in tea. Bookmark the permalink. Leave a comment.